The Irish manager was happy with his side’s performance as Ireland made it two qualifier wins from two. 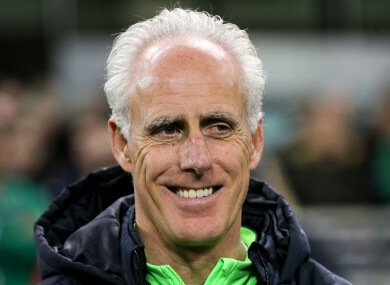 MICK MCCARTHY WAS glad that his Irish players were unaffected by the tennis ball protest that briefly interrupted play in the 33rd minute of tonight’s Euro 2020 qualifier win against Georgia. The manager had hoped that Irish fans would reserve any anti-FAI protests for away from tonight’s game, joking that he might bring a tennis racket if rumours that disgruntled supporters intended to chuck tennis balls onto the pitch came to pass. It did happen, and while play was briefly interrupted, it certainly didn’t affect Ireland who then immediately took the lead through Conor Hourihane’s stunning free-kick. “It was balls, wasn’t it?”, reflected the Irish manager at his post-match press conference. “I was concerned it would affect our concentration after our free-kick, if they break on us. I don’t know if it affected their concentration or not but it doesn’t matter what happened there was no stopping that free-kick. “I don’t think it affected the game at all. I think most fans have come in to watch the game and cheer on the team. I think they all did that, and some came into have a pop at the FAI and other things, and have a demonstration. McCarthy admitted he hoped the protest wouldn’t go ahead…although he was prepared if it did. As regards the actual football, McCarthy declared himself happy with his team’s performance. “There was a lot that pleased me tonight, individual performances; the all-round team performance, which I thought was excellent. We’ve had a great week, working and training. We’ve stopped them from doing what they want to do. I thought we played some really good football. Conor Hourihane; the three midfielders were a different class, I thought. Didsy [McGoldrick] up front was excellent. McCarthy elaborated on the performance of his goalscorer. “I’m delighted, because his performance on Saturday was excellent. Tonight his deliveries his free-kicks and corners were good. Elsewhere, the manager hailed the performance of Glenn Whelan as “absolutely remarkable”, and while he was proud his side continued to attack in the game’s final stages, it was tempered somewhat when James McClean’s decided to hang a cross into the box in stoppage time rather than keep hold of possession. “Before I got to him, [he was] saying ‘I know, I know, gaffer’. I didn’t need to tell but I thought I’d tell him anyway. Switzerland and Denmark played out a thrilling 3-3 draw in the group’s other game, meaning that Ireland finish the second round of games top of the table, with two wins from two. As to whether that draw was a good result for Ireland, however, McCarthy refused to speculate. “Our result was a good result for us. Email “'Paddy Power had odds on me getting hit on the head' - McCarthy unmoved by tennis ball protests”. Feedback on “'Paddy Power had odds on me getting hit on the head' - McCarthy unmoved by tennis ball protests”.